How would you like to be the one bragging when you go out with the guys tonight, that you've already pre-ordered the HTC One? U.K. retailer Clove is now accepting pre-orders for the sleek looking device with the beautiful 4.7 inch FHD screen. While no official launch date has been announced, Clove says it expects to have its first batch of inventory on March 15th. That would be the day after Samsung is expected to take the wraps off of the Samsung Galaxy S IV. Decisions, decisions. 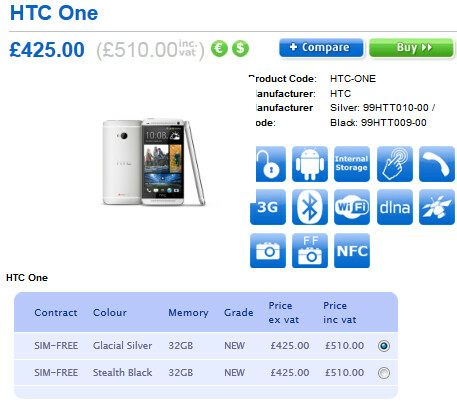 Clove is reserving the 32GB HTC One in Glacial Silver or Stealth Black at a price of £425.00 ($658.32 USD) pre-tax and £510.00 ($789.99 USD) after-tax. You can also enter your email address so that you can be notified when the phone is actually in stock. Will the HTC One be able to turn things around at HTC? The Taiwan based manufacturer obviously felt the need to introduce its new flagship handset today, before the noise and hoopla of MWC distracts potential buyers. But it is important to remember that the device won't actually be released until March. With all the excitement that the HTC One has created today, there are still plenty of crossed fingers in Taiwan as HTC executives worry about maintaining the "buzz level" during and after next week's MWC in Barcelona. HTC really had no choice but to introduce it's new flagship model before MWC. Had they waited until the show itself, or even afterward, the model might have been lost in a sea of new phones. The gamble that the manufacturer has made is whether the excitement over the HTC One, and some of its new features like the Blinkfeed, will still be there after the lights are turned off at MWC 2013. In the meantime, if you want to be the first on your block to pre-order the HTC One, you can do so now, from Clove. See this is what I love about Samsung, HTC, Sony and almost other companies, the companies who innovate the most along with a complete all round product takes the market share. Unlike Apple who hold stupidly good market share inspite of incremental upgrades. Well... if the phone gets sold through T-Mobile without T-Mobile logo on it... I'm down to get the phone from T-Mobile. Don't got the cash to put down up front, but is down for some monthly payments. Found out that Clove.uk doesn't accept paypal nor discover card upon check out. Lets hope handtec.uk has pre-order soon.